Still keep pinching myself at the amazement of how time literally & figuratively flies...It seems just yesterday that I nervously typed out my first blog post, meekly introducing myself & my ridiculously lofty ambitions of what I wanted to do. About two years later, I'm still at it, a testament to how powerfully passionate food can be. The 100th post seems to be a great time to pause, and thank everyone who have been supporting me. Can't stop thinking about my parents of course, My dad, who was a foodie 50 years before it became the 'in' thing, He'd often recall how he would be ridiculed as a 'theethipatteri' (derogatory term for someone who appreciated flavors & tastes) by the standard band of extended family relatives.. So take that, you old fogies, I'm SO proud to be his daughter! My Mom, who never thought that her daughter ever paid attention to her perfect instructions for creating the best comfort food I've ever had. I so bitterly wish she was around for me to pepper her with questions & doubts. My aunt Lakshmi, who's now my go to for questions & my uncle who takes pride in my yapping non stop about food. My darling family (who happily double as guinea pigs), Ganesh, my other half, & my precious sous chef Ishaan who's blunt comments about some of my dishes keep me in check as only a 6 yr old can, & he's doing a great job teaching his kid sister to do the same! My 'gurus' : The family of blogger & food authorities that I've stumbled upon via Panfusine & Facebook. Ammini Ramachandran, Monica Bhide, Suvir Saran, Raghavan Iyer and the sparkly duo of Jigyasa Giri & Pratibha Jain of Pritya books . I've a long way to go in terms of learning more about their passion for food and attention to detail. Thank you Aparna, Manisha, Sala, Siri, Harini, Soma, Dhivya, Lata, Sonali, Cynthia, Anu, Pavitra , Prerna, ..you make me so look forward to every morning and read about your wonderful culinary adventures!.. This is just a partial list, I could go on & on! & Finally, The Almighty.. 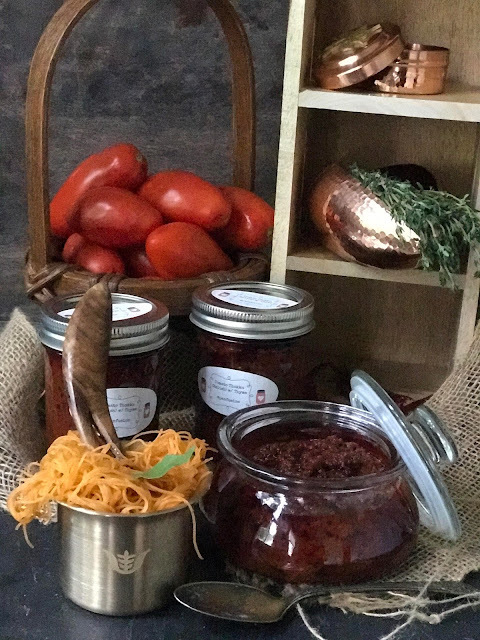 This recipe has been churning virtually in my brain for over a year, but chose to manifest itself in reality in time for this special post. My family looks to the reigning lord of Pazhani, as our guardian deity( Kartikeya, the lord of war in the form of an adolescent boy), Pazhani is a beautiful temple town in Tamil Nadu. 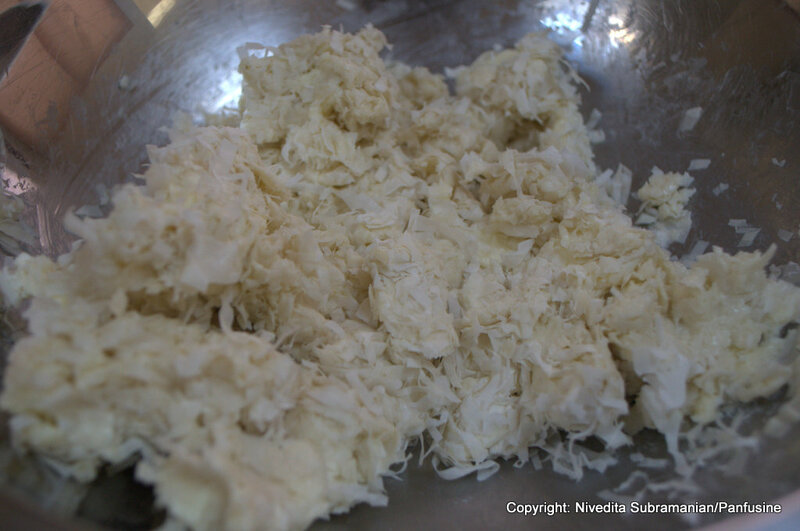 The prasad, or holy offering at this temple is a thick pudding known as Panchamrutham. (Panch - five, Amrutham - ambrosia). 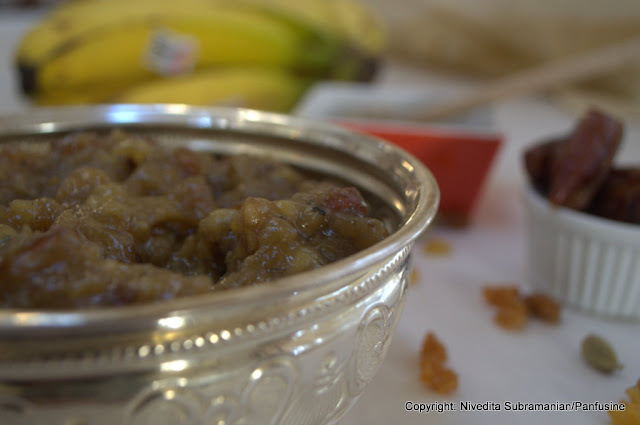 Its made with five primary ingredients, Banana, raisins, jaggery, honey & dates. The method described below is NOT the traditional way of making panchamrutham, but comes pretyy close in taste, flavor & texture. I've used this fabulous confection as a filling for a 'kanafe', a middle eastern dessert made with fine shreds of vermicelli like Phyllo pastry. 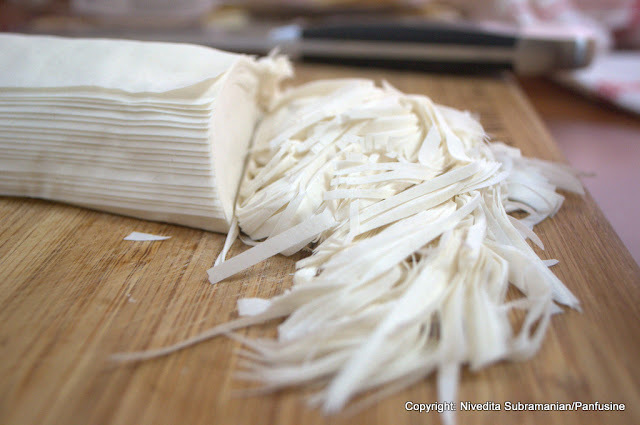 (the fine shreds are made by painting a flour batter on a hot surface & gently lifting the shreds). The shredded pastry then has a layer of nuts & cheese (like ricotta) between two layers, baked to a golden brown and drizzled with honey. The traditional way is to bake it on a sheet like baklava, but I opted to use muffin tins to get readymade portions. So, here's to the next 100 posts and my 100th recipe! 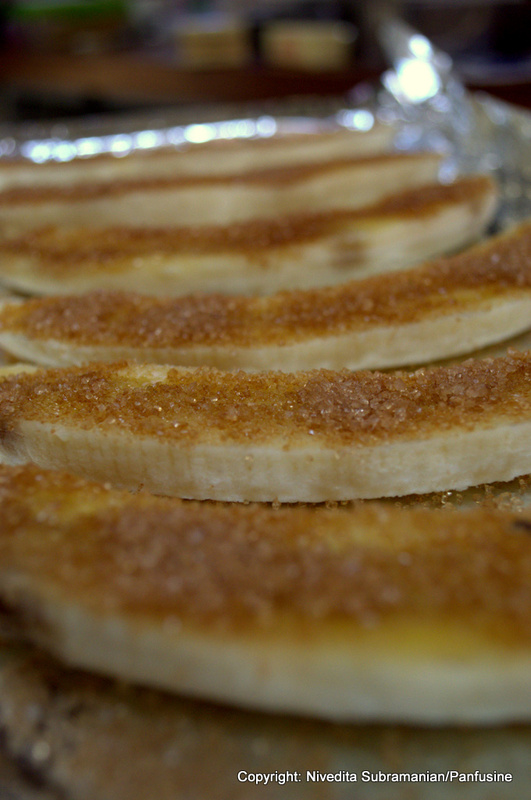 Place the bananas cup side up on a foil lined baking tray, cut side up and sprinkle liberally with sugar. Place under a broiler & grill until the sugar begins to caramelize. transfer to a mixing bowl along with the dates. Add the crumbled jaggery, water, raisins & honey in a heat proof bowl. Microwave for about 1.5 minutes until the jaggery melts into a viscous liquid. Add this, along with the powdered cardamom to the grilled fruit & date mixture, and mash into a thick paste. Set aside to cool. Combine the panchamrutham & ricotta cheese together in a mixing bowl & lightly swirl around to partially combine. Without unrolling the phyllo pastry, cut the roll into thin slices to obtain long strips of the pastry sheet. Add these to a large mixing bowl along with the melted butter. 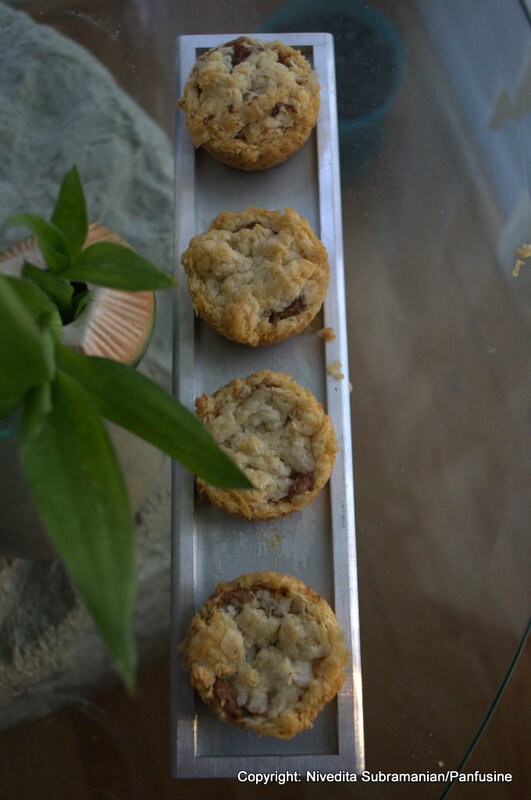 Using your hands, shred the pastry as you evenly coat it with the melted butter. 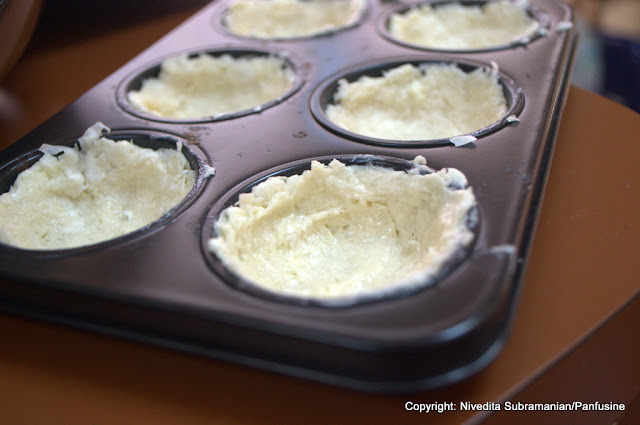 Line the bottom & sides of a muffin tin with the butter/phyllo mix as shown below, reserving some to cover the top. Bake at 325 F for about 20-25 minutes until the surface begins to turn lightly golden. 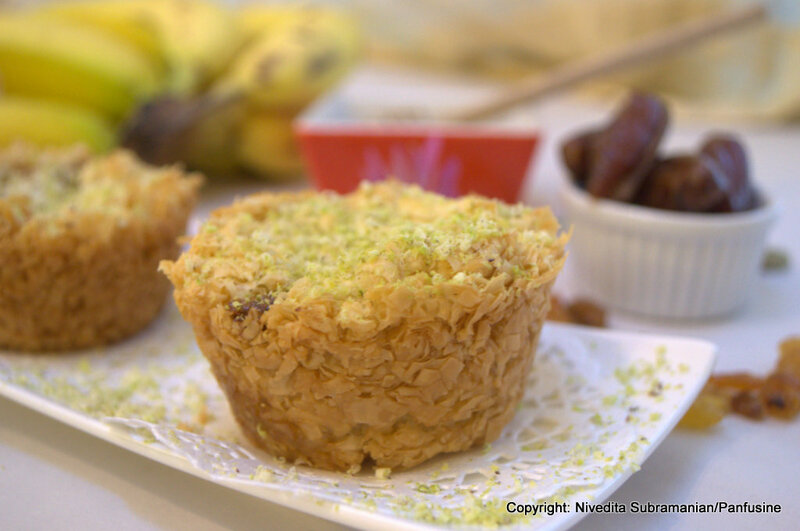 Drizzle with extra honey if desired & garnish with shredded pistachio. 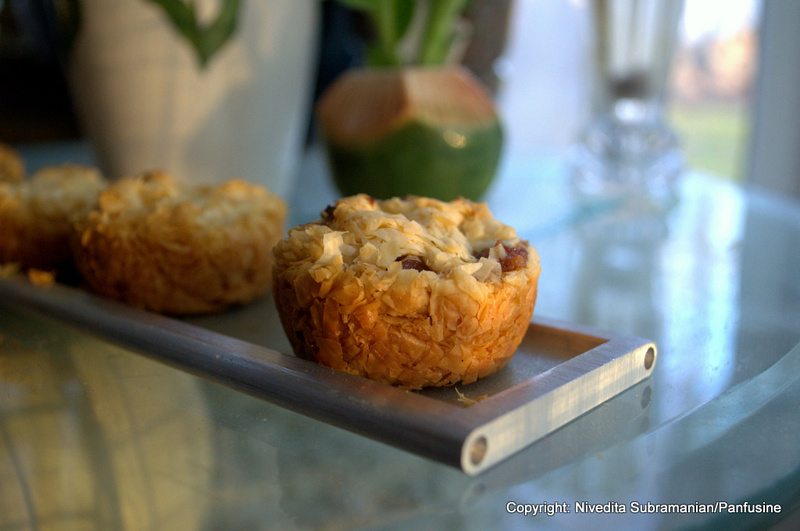 Serve with cups of piping hot masala tea or coffee. 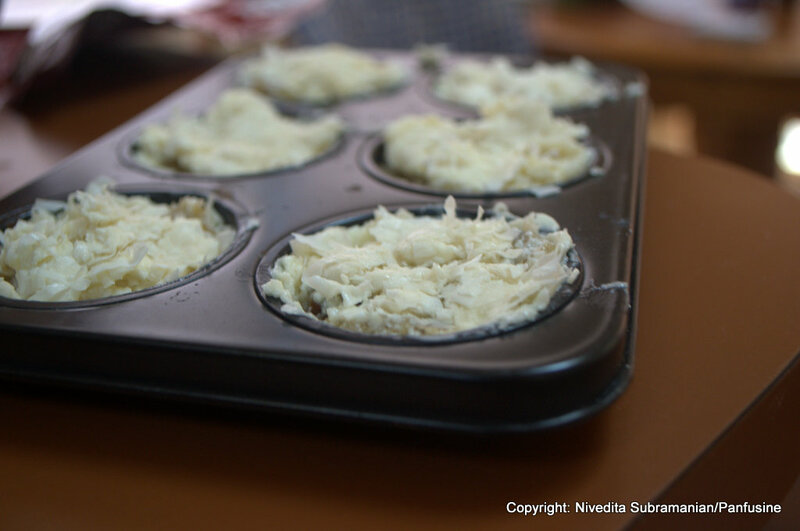 you may opt to omit the ricotta cheese & simply use the panchamrutham alone in the filling. I tried both versions & loved them both. Bon appetit! OMG Niv!! Panchamrutham as a dessert??? Yes please! Panchamrutham is one of my most favorite prasadams, I always shamelessly go in for seconds and thirds and tenth's for this one. This recipe is pure genius, I love your fusion of traditional and modern food. Wish you many many more centuries to come and may we see many more innovative dishes from you :) Happy cooking and blogging!!!! Thanks AMbika, I'm trying my level best not to scarf the whole lot down..as tempting as it is! First of all, congrats on hitting a century and wishes for many, many more. Secondly, have to admire your creativity. Never would have thought of making panchamrutham into a dessrt. Looks gorgeous. And lastly, thanks for mentioning me. Happy to know you too. Such a great fusion recipe, Niv! If prasadams came this way, I am sure they would turn into desserts. :D This looks the best pachamrutam I have ever seen! Hearty Congratulations on posting 100 recipes Niv. It is great knowing you and your passion for food is so infectious :D. the recipe is a testament for how creative you are. Kudos and Cheers to many more such recipes and accolades. Congrats Niv !! and Oh my ! What a terrific fusion dessert ! Hats off to your creativity ! So brilliant your tweaks are! LOVE it and those caramelized bananas are making the Malayali in me drool :) Congrats on your Century and all the achievements Niv! Wonderful Niv...Panchamrutham as a dessert!! !Congrats on the milestone!and may u reach many more in ur panfusine journey!Pazhani is my parent's kula daivam too!Keep up the good work! Ha ha I can totally see you standing on the stage in that beautiful white kurta and speak all that you did here ;) Such a beautiful post. I wish I did something for mine. But I cannot come up with such things. I miss my mom too, so bad. I wish she had a glimpse of what I do, may be she does.. who knows..
Have been waiting for this recipe since I saw the photographs. How creative!! and finally Congrats and keep doing the wonderful thing you are doing.